Why is it that imagery seems to translate so willingly, from subject to artwork, and from artwork to viewer? Phenomenologists spoke of the primacy of perception, because there is a general sense that looking feels to us like a no-brainer, so immediate and ancient so as to require minimal mediation. The work of Dutch contemporary artist Hedwig Houben suggests how empathy might be implicated in the process of art making, and how stepping into the shoes of the Other may be implicit in looking and making by blurring the boundary between artist and subject. In thematising her own artistic practice, issues concerning authorship, identity and the nature of the artistic process itself are examined in the context of a world in which new media seem to comfortably accommodate an emerging notion of distributed identity. 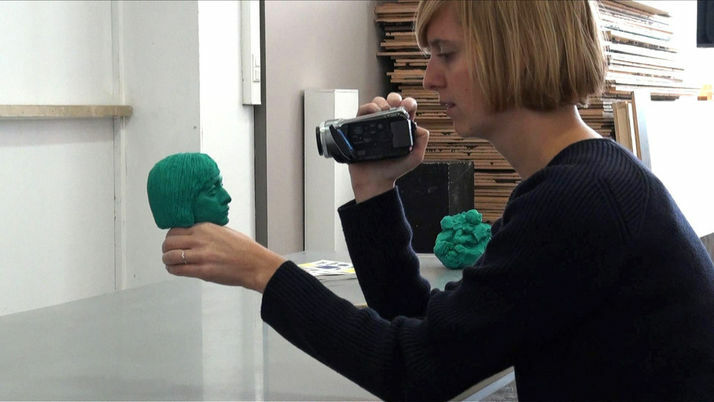 In her work The Hand, the Eye and It (2013), Hedwig Houben delivers a compelling performance lecture; sitting with a large lump of fleshy-coloured, marbled plasticine before her, she talks to her audience about the process of making a sculpture. She demonstrates an encounter with this material; an orb of potential under the vague spell of artistic process, while spontaneously enumerating for us all the meticulous and risk-filled decisions made while engaging with it. The richness of Houben’s description of the encounter is puzzlingly contrasted with the apparent simplicity of her predicament. Her appearance is so uncomplicated, wearing a black turtleneck and taking occasional sips from a nearby glass of still water. Yet every gesture, and every attitude towards this lump of plasticine is, according to her, abounding in consideration and consistently a matter of consequence. With her hands she prods and tweaks, smoothes and gouges. Out of the substance she is exploring, is drawn a possibility of articulation, and minute touches are imbued with meanings appearing before our very eyes. Assisting her in delving into the materiality of her subject is a prosthetic hand, made of the very same plasticine mixture, serving to bridge any gaps between “the artist”, “the performer” and “It”. With her organic hands she is struck by both the otherness and malleability of the clay. It is cold, it is smooth, it has swirly patterns in it where different colours merge together: she is affected by the characteristics of the Other. The prosthetic hand, meanwhile, offers her the key into this thing outside herself. It looks so much like her own hands, but it is made of an alien substance, suggesting to the maker that things can morph from one thing to another: that Houben can give up her own hands, and incorporate herself into the clay in order to animate it. Meanwhile, the viewer feels herself spellbound with an organic, primary kind of attentiveness. Much as Houben gives up her hands to the medium of clay, watching her do this is, in turn, a surprisingly tactile experience, affording the audience an unusually first-hand insight into the position of the artist, in all its apparent simplicity, and implicit turbulence. Houben often works in this manner of non-assuming authorship. The work is being made, and the work is being done, but this process she presents as a collaboration between disparate agents. In her self-reflective practice Houben often plays with illuminating this distribution of authorship and artistic engagement by dividing herself and materials into autonomous creatures. Her role is that of a child playing with dolls and action figures. By ventriloquising representative participants of the art process, a scene is set, and the artwork unravels beyond her control. “In her video work ‘Personal Matters and Matters of Fact’ Houben in five scenes lays bare sculptures’ doubts, insecurities, possibilities and capabilities. A Rietveld chair, a sculptural self-portrait and the artist herself engage in a conversation, trying to make sense of each other, of why they are there and of how they came to be”. 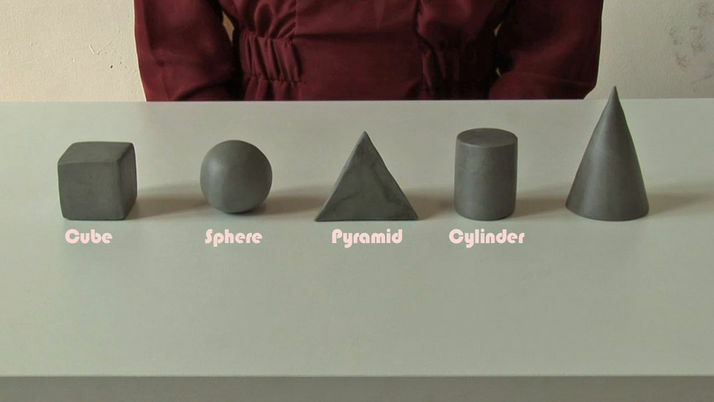 Likewise, in the video work Color and Shapes, a Short Explanation of my Artistic Practice (2010), the camera focuses on a series of generic three-dimensional shapes modelled in clay: a cube, a pyramid, a sphere, a cone and a cylinder. Each represents a different character of approach in her artistic endeavour: where the cube is more cerebral and conceptually concerned, the sphere is more frivolous and spirited. The conversation that ensues between these characters is humorous due to their irreconcilability, and particularly evocative of the persevering doubt that seems to be the scarlet thread of Houben’s, and arguably most, artistic processes. Yet of particular interest is her very approach in turning around herself in an attempt to take stock of her own hesitation in the artistic state of mind; a methodology for methodology. There is an interesting aesthetic choice of clarity of an almost pedagogical kind detectable in her demonstrative presentations (from conference-like lectures, to 3D analytical diagrams of abstract sculptures, to kindergarten blocks of generic shape) that is in her work used to convey a process Houben herself understands as a minefield of doubt and insecurity. It is a gracefully frank approach to understanding the condition of art making. In pursuing this question she opts to scatter herself into autonomous agents, such as the Hand, the Eye and the It. In her book Unmarked (1993) Peggy Phelan makes the poignant claim that the desire to see the Other implicit in perception originates from the painful impossibility of the eye to see itself (the self is a particularly overt omission from the visual field). In order to see oneself, the eye takes a “detour” through the Other, such that perceived subjects appear in our own guise. Is Houben deliberately imposing otherness on her practice, in order that it may stand back and talk about itself? Through mutual interrogation between constituent elements of the unfolding work (hands, eyes and all) the work self-authors, placing Houben at once in the role of collaborative agent, and startled spectator. In the very act of “shape-shifting” into disparate agents representative of Houben’s practice lies one particularly interesting feature of the making process, namely, the incorporeal engagement with material that lends itself to the kind of intimate communication characteristic to art. As a little girl learning to draw, I found the first lesson of looking to be rather alarming. It challenged something so indisputably given about my everyday experience. I learned that I could not see, and that I was blind to things right in front of me. The drawing was consistently wrong, no matter how I tried to coordinate my looking with the movement of my hand. But it was on becoming aware of the selectivity of my visual attention that I realised there were an infinite number of ways of looking at the same thing, and that its “reality” only manifested itself in relation to that fickle structure of perception that guided me. With no givens in perception, the issue of representation was now replaced by the far more enigmatic question of seeing. While looking at the subject was one thing, the act of drawing was like extending visual tentacles that could probe my subject, in a humbling desire to see the Other. The hand-eye-desire coordination of drawing is therefore as much tactile as it is visual, whereby the drawing acts as a prosthetic mechanism (much like the metaphor of Houben’s plasticine hand) enabling access into the otherwise unknowable “It”. As I drew, flitting hand gestures upon paper became the ticking metronome forcing me to repeatedly look anew at my subject. The assimilation of the wordless intent (my desire to know the Other: a doll, a tree, a face), with my very body, constituted a situation in which each line drawn became the trace of a virtual skin I felt I was wriggling into, like a suit. The assimilation of looking with moving, mirrored the assimilation of the artist’s identity with that of the subject of her interest. It seemed inherent to have to empathise with the subject, in order for it to lend itself to inspection. “The landscape thinks itself in me”, said Cézanne once in an interview, “and I am its consciousness”[i]. Could an artist merely be a means for her environment to “think itself”? Intrigued by this humbling fresh glance at the roles of artist and subject, French philosopher Maurice Merleau-Ponty was compelled to adopt this localised philosophy into a broader ontology known as phenomenology. The image literally enters us, splays itself across our retina. Meanwhile, the seeing body, being made of the same stuff as the world it sees, simply makes it possible for the world to see itself. Our vision becomes the mediator between the world and itself, just as Houben’s plasticine hand becomes the “mediator” between the artwork and itself, making visible something that should be totally obscured by its own all-encompassing quality[ii]. In all modesty, Houben presents the art process as an event, a precious snippet of a moment when an “art circuit” is closed, and disparate collaborating agents are in conversation. In yielding to the world, we might acknowledge the infectious effect these works then have on the passive observer (including the artist). Seeing is impressionable. The vision of a tree feels grounded and majestic, whereas the emergence of a cloud feels light and feathery. Sight extends an experience of the thing seen. By looking, we empathise – the vitality of the image leaks into us,[iii] and in turn the image lends itself to anthropomorphism – body in exchange for body. Katarina Rankovic is a London-based artist and writer, studying for her BA in Fine Art at Wimbledon College of Art. She is currently writing a novel about a lethargic line, making “empathy drawings” and assuming disguises in imitative performance pieces. Poised sensitively between practice and theory, Katarina’s research explores the potential of art making as methodology. Chauvin, Laetitia, (2012), ‘Contributions à l’analyse des éléments sculpturaux Hedwig Houben’, Code 2.0, No 4, p31-33. Gell, Alfred, (1998), Art and Agency: An Anthropological Theory. Oxford University Press. Hoftstader, Douglas, (2007), I Am a Strange Loop. Basic Books, New York, New York. Johnson, Galen, (1993), The Merleau-Ponty Aesthetics Reader, Philosophy and Painting. Northwestern University Press, Evanston, Illinois. Phelan, Peggy, (1993) Unmarked. Routledge, London. Strathern, Marilyn, (2012), ‘The Whole Person and Its Artifacts’, Annual Review of Anthropology, No 33, p1-19. [ii] Hedwig Houben uses the term “mediator” in her description of this work. See The Hand, the Eye, and it (http://www.hedwighouben.nl/portfolio.pdf). [iii] Here I paraphrase Pierre Huyghe on his dOCUMENTA(13) installation Untilled (2013), describing his intention to superimpose a fictional image upon “reality” and allow geological processes to interpret its “leaking vitality”. See Huyghe, ‘The Association of Freed Time’.